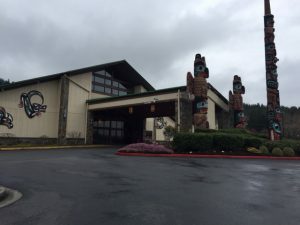 A few days ago we rode the Olympic Discovery Trail from the new Discovery Bay trailhead to the Seven Cedars lodge/casino on Jamestown S’Klallam tribal land. This section was new to us, although we’ve ridden much of the rest of the trail. 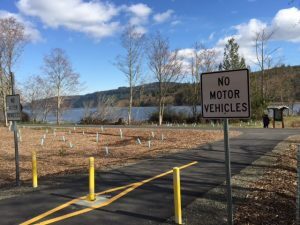 The idea grew out of discussions between 3 young peninsula bicyclists who were interested in creating a public access trail for non-motorized travel between Port Townsend, Port Angeles, and the Pacific Coast. The idea took root and the Olympic Discovery Trail (ODT) was created. 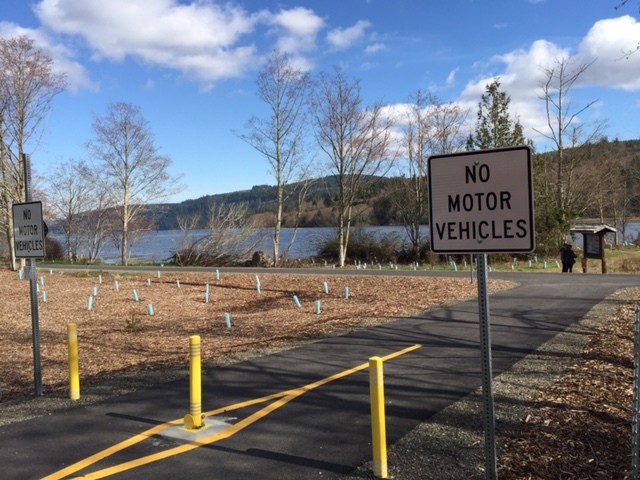 The trail was to connect the population centers of the area, from Port Townsend on Puget Sound west toward Forks, about 100 miles, utilizing as much as possible the abandoned Milwaukee Railroad corridor. This mission was later expanded to extend the trail another 30 miles to LaPush on the Pacific Ocean. Long stretches of the ODT are completed, and often offer terrific riding experiences. The shortcomings of the trail are seen in the transitional, often temporary stretches in between. With fragmented development, new riders’ need for information about how to get from one section to the next has sometimes been overlooked. It seems that signage is always the last piece to be put in place. We highly recommend obtaining the paper maps of the trail that most peninsula bike shops have available. They’re very helpful, although at times outdated due to new sections coming online. This stretch from Discovery Bay starts with beautiful water views on a new wide paved path. After a couple of miles, it transitions to low-traffic, paved back roads (we probably saw three cars on the entire ride). In the middle there is an unpleasant, although not necessarily dangerous, two-mile stretch on the wide shoulder of Highway 101, and a much more pleasant run of newly-paved winding path through pastures and past duck-filled ponds. The last piece returns to Old Blyn Highway, a little-used paved road, followed by a fun downhill paved path to the Jamestown S’Klallam art gallery (and a well-maintained restroom). Another mile of paved path leads to the tribal casino and…lunch! The food was outstanding. The slot machines and poker tables…well, suit yourself. All in all, it’s a very pleasant ten-mile (one way) trip, which can be easily extended as desired by continuing on towards Sequim on paved path. I’m sure we’ll be back!